The Hunter 10x20 Bunkhouse cabin has 200 square feet of space with a 4x10 foot porch, a four-foot loft and a 10x16 foot interior. Each wood cabin starts off as an unfinished shell, and you have the option of adding interior bunk beds and a layout that best suits you. The interior of this beautifully crafted bunkhouse uses pine tongue and groove roof sheathing, pine rafters and pine tie beams. There are three interior windows and an Amish wood entry door. The ladder rungs and loft railing are all trimmed in aromatic eastern red cedar. You have the choice of the interior layout for the door and window placement. You may also choose to extend the porch and loft into the interior of the wood cabin, with the 10x20 Hunter extending to a 5-foot porch and loft which would result in a 10x15 foot interior at no charge. The cabin has an Amish milled 2-inch pine tongue, and groove kiln dried floor. You have the choice between a 30-year designer Architectural shingle roof or a 40 year painted tin roof. The Hunter Bunkhouse is available from Trophy Amish Cabins in Southeast, Michigan. Trophy Amish Cabins offer nationwide, turnkey delivery to your building site. The Hunter 10x20 foot cabin has 200 square feet of space, with a 4-foot front covered porch and a ten by 16-foot interior. The Hunter cabin also has a loft. The Hunter cabin comes with an Amish wood door and a standard interior with pine tongue and groove roof sheathing, pine rafters, and pine tie beams. The Hunter has interior windows, door, ladder rungs and loft railing that is trimmed in aromatic eastern red cedar. You have the option of window layout and door placement. The standard porch size for a ten-foot cabin is four feet, with the extended porch/loft into the interior at no extra charge. The cabin is an Amish milled Pine tongue, and groove kiln dried floor. With the Hunter cabin, you have the option of adding a wood stove and double wall interior pipe and double wall insulated stainless steel roof pipe, with flashing, caulk, cap, extension, brace and custom cedar wall intake vent with block off plate. This option is only available in a shingled roof. The Hunter is available from Trophy Amish Cabins located in Southeast, Michigan with nationwide, turnkey delivery available. The 10x18 foot Hunter cabin is a 180 square foot cabin, with a three-foot porch, loft and a 10x16 interior. You can choose the basic Hunter cabin, or you can take a look at the available options to add into the cabin. Some of the options you can choose from include built-in bed frames, stools and built-in bunk beds to name a few. The Hunter is a genuine high-quality custom Amish crafted solid wood cabin. You can use your cabin as a weekend getaway, workshop, studio, gallery, hunting or fishing camp and more. The Hunter cabin uses Eastern White Pine and aromatic Eastern Red Cedar tongue and groove lumber, hand built by their highly skilled team of Amish Craftsmen. You will find the Hunter cabin available from Trophy Amish Cabins. They have a variety of cabins to choose from, in several sizes to suit your budget lifestyle and needs. Trophy Amish Cabins custom builds and delivers your Hunter cabin to your prepared building site. Trophy Amish Cabins does not offer prep site, so you will want to have the site prepped before the cabin arrives. You can choose to prep the building site yourself or contact a local excavator to prep the site for you. It is recommended that you select a high flat spot on your property which will help to maximize your views and is away from any flood zone. You want to level the area and top with two inches of crushed stone, level and compact. 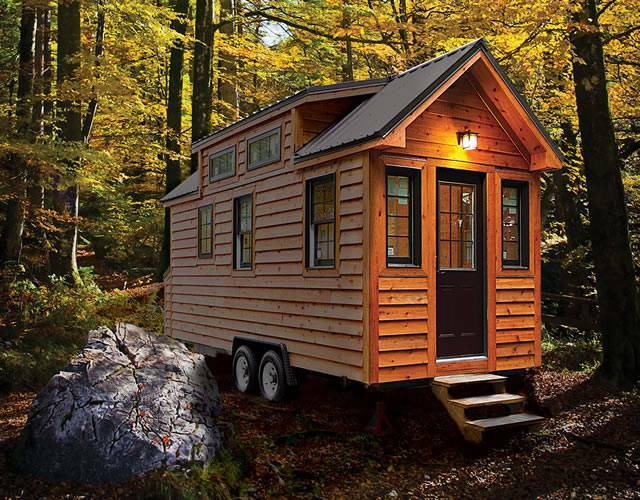 The Hunter Promotion is a 160 square foot cabin that is perfect for a variety of uses. The Hunter special promotion is a basic wood cabin that comes standard with three windows, an Amish wood door and a tin roof with your choice of exterior stain color. Each Hunter Promotion cabin is custom built as are all of the Trophy Amish Cabins. 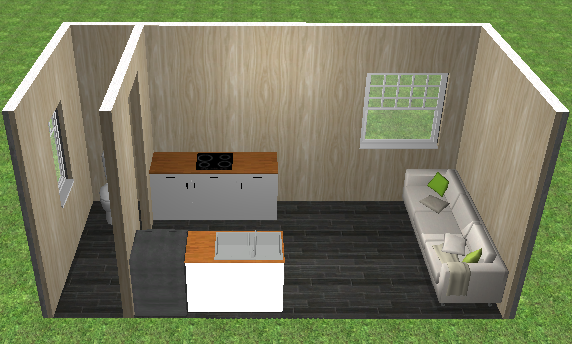 You can draw your own cabin layout, and specify the window and door placement. The Hunter cabin has the option of basic rough wiring available. This beautifully crafted tiny cabin has aromatic eastern red cedar interior trim accents around the windows and entry door. You will want to look at the website for some of the furniture options you may add to the basic Hunter Cabin. Some furniture options you may choose include stools, queen bed frame, built-in full over full bunk bed, and pine faced rollout drawers to name a few. 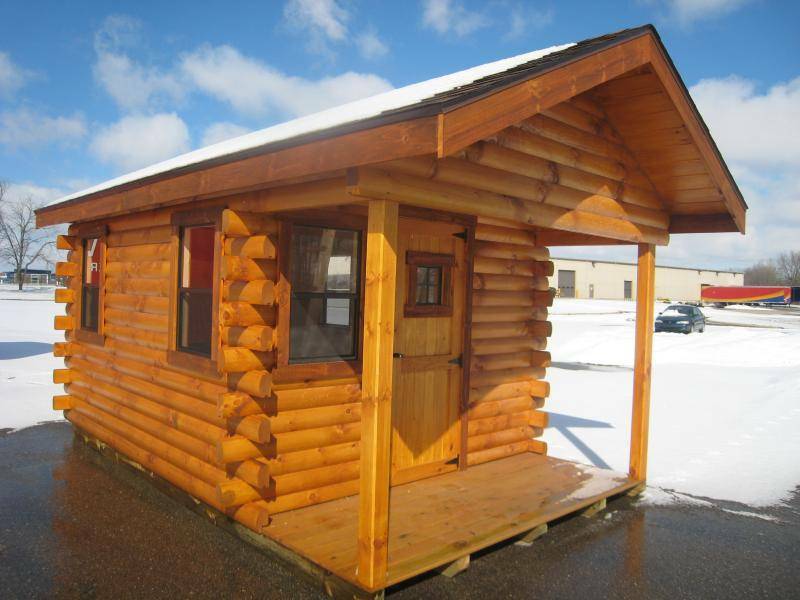 The Hunter Promotion cabin is just one of the wood cabins available from Trophy Amish Cabins. Trophy Amish Cabins is a small family business located in Southeast, Michigan. Trophy Amish Cabins offers nationwide, turnkey delivery. Wood cabin are delivered by their specialized delivery crew using custom-built extendable tilting fifth wheel trailers, which are custom designed to deliver cabins. This allows them to drop the cabin right where you want it. Simple living at it's finest; this tiny house shows a design that is easy and inexpensive to build. Sometimes the simplest configurations just work the best, and this tiny house design showcases that very well. While the inside of the home is not finished yet, you can imagine and see the potential for the future layout and furniture that will occupy the space. It's also interesting to have some insight into what the process of building a tiny house looks like. This tiny house would be considered to be at the shell stage of the building process which means that the exterior is finished, but the interior still needs to be completed. Some companies offer tiny house shells much like this one which can then be finished by the customer in their own time. Not only is this an excellent way to save money on your tiny house build, but you also get some hands-on experience with the build of your home. The exterior of the home is kept pretty neutral with beige siding and white trim. The deep red door is a nice touch that adds some colour and elegance. Inside, you could imagine a country chic or farmhouse style decor with a farmhouse style sink in the kitchen and lots of real wood finishes. It could also have a lot of refurbished and upcycled furniture and some great deep rich red fabrics to continue the theme of the red door. The sky's the limit when it comes to the interior design of a tiny house so what do you see for the future of this small home interior? The Tiny Retirement is a perfect tiny house design for those who want a single level only with no loft space. This makes everything very accessible to the dweller with no ladders to climb. Plus, it allows for more ceiling height causing the area to feel more extensive and more open. The tiny house on wheels measures 20 feet long which makes it very easy to tow using a pickup truck. That also makes it great for travel or moving around to different places. The door is configured on the longer side of the home which allows more space on the ends for the bathroom and the living room area. In the centre of the home is the kitchen area which has a mini-fridge, a microwave, a toaster oven and a coffee maker. They most likely also have an electric range for stove top cooking as well. The small sink is created out of hammered stainless steel, and there's even a window over the sink for great views while doing the dishes. Bar style seating in the kitchen can accommodate two or three people, and there's a beautiful large window to look out of while enjoying a meal. In the living room is a classic futon which allows the sofa to turn into a bed when needed and there's also a TV mounted on the other side of the home so you can see it from anywhere you're sitting or standing. From the outside, this tiny house design looks like your average suburban home and would fit in nicely anywhere it was able to be parked. 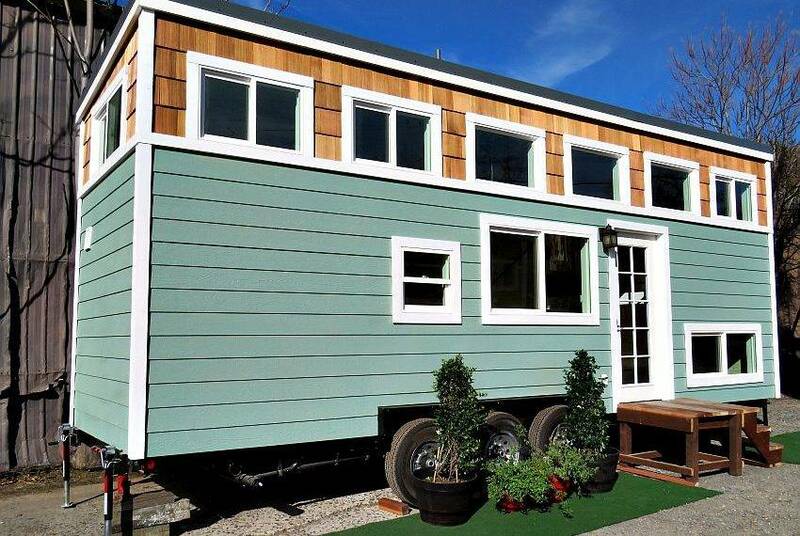 From the outside, this tiny house on wheels looks pretty similar to many of the tiny house designs out there. However, on the inside, this tiny house has a few design features that make it quite unique. For starters, unlike most tiny house designs, this one doesn't have loft spaces. Since some people don't like the idea of having to climb a ladder, or they don't want their sleeping space to feel too stuffy or cramped, a loftless tiny house design is a great option. The alternative solution to this is to come up with the perfect pull out bed that can be rolled away during the day and act as a sofa. The bed hides out under the raised kitchen area within the platform that the kitchen sits upon. Up a couple of stairs that also act as storage, is the small kitchen which has a mini-fridge and a sink with cabinets and a butcher board countertop. There's also a bar table that can be used as a space to eat or to work at that overlooks the rest of the home. When the bed is fully extended, it only reaches to the door, so there is enough room to walk around to get to the bathroom on the other end of the tiny house. Of course, the bed must be made to be rolled away each day, but that would only take about 5 minutes or so. The way this tiny house is laid out makes it very functional, and the design is a very efficient use of the space. 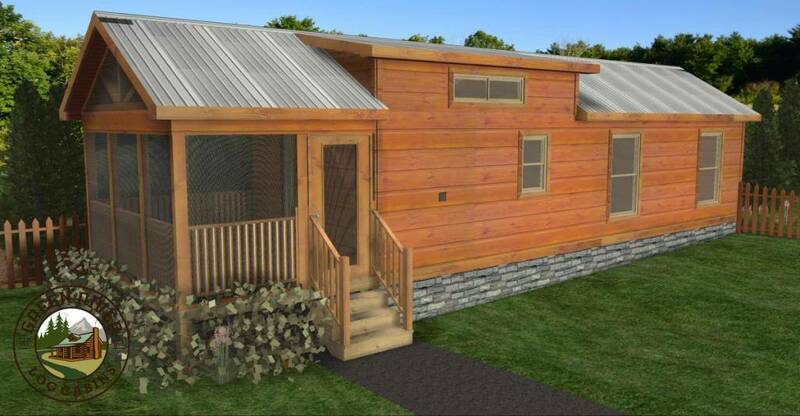 It's easy to see why this is one of the most popular designs from Tiny Home Builders. This design features everything needed in a tiny house design including vaulted ceilings and a smart floor plan. 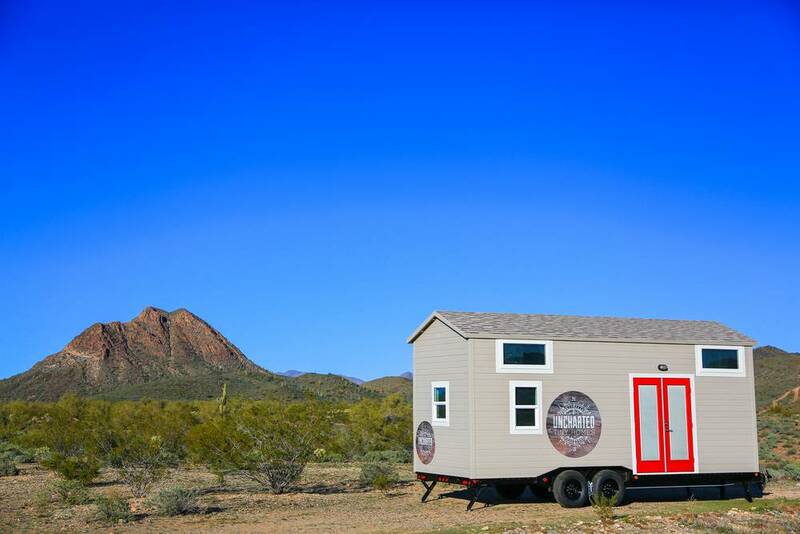 The tiny house on wheels is available in a few different lengths including a 12 foot, 16 foot and 20-foot option. Each of the sizes will include a kitchenette, a loft and a bathroom no matter how small. You can see the different sizes and how the floor plan will vary depending on the size, but one thing that's always consistent is the fantastic craftsmanship and high quality of the builds. Every home is decked out in wood siding of superior quality, and all of the cabinetry and fixtures are also the best quality. With these simple tiny house designs, the loft is accessed by a ladder which can be stored away when it's not in use. The loft features enough room for a mattress and three small windows for light and ventilation. The smaller model features just one window in the loft which is still enough to bring some light into the small space. Most of the designs from Tiny Home Builders can be customized to suit the client's needs, and any desired additions or alterations can be made. This is an excellent example of a classic tiny house design and floor plan that can be built upon by the owner when they take ownership. The walls can be painted, furniture and decor added to make this little home on wheels comfy and cozy. Here's a rendering of a unique tiny house design complete with a built-in patio. It seems to be a tiny house that's built onto a foundation, but a design like this could easily be built on a trailer as well. The rendering shows us motorcycles parked out on the patio which would be perfect for those who ride. It would also be an excellent space to set up some outdoor furniture to lounge outside or to set up a barbeque and an outdoor dining set to enjoy meals al fresco. The tiny house design itself is quite minimal and scaled back compared to other tiny homes. It doesn't feature a bedroom area or a loft, but a simple living room, kitchenette and a bathroom with a shower, sink and toilet. Adding a sofa bed in the space could make the living room double as a bedroom, but it would be pretty close quarters. The kitchen would be great for making simple meals and could hold a small fridge, a toaster oven and an electric range with a sink to wash up in. Smaller homes like this one are great to use as guest homes or as a small vacation or laneway house to rent out to travellers who only need a small space. This and other tiny houses like it are for the adventurous spirits who like to live life outside of the box or try out different accommodations when they're travelling. It also shows how easy it is to design your very own tiny house from scratch using a program like Sketch Up or something similar that you can find online or through an app. Open, clean and bright are three words that come to mind when having a look at this beautiful tiny house design. The Bunkhouse is a family-friendly tiny house design with enough room to house an entire family. 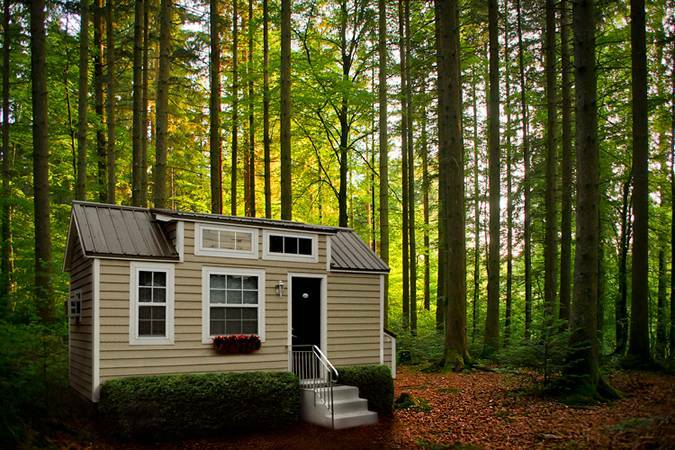 With 310 square feet and a total length of 30 feet, this is one big tiny house. The design includes a huge 12-foot master loft for the parents to sleep in as well as a private bedroom for the kids with two single beds in it. This gives the kids enough room to play in their room as well, which is very important. Another essential feature of a family home is the kitchen which is at the heart of this tiny house. The builders, Uncharted Tiny Homes, created a functional galley kitchen with plenty of cabinetry and butcher block countertops. Then, they also added in a full-sized fridge to stock up on fresh food and a gas range built into the countertop. Close to the kitchen is the living room which features a full-sized sofa that the family can relax on. The bathroom is also very impressive with an all-in-one washer and dryer, a large shower and a composting toilet so the home can be off the grid. Also to comply with an off-grid lifestyle are the massive solar panels on the roof of the house that could supply power to the home via the sun's rays. For those in need of a larger floor plan, the Bunkhouse definitely ticks all of the boxes when it comes to comfortable and practical living. It's hard to think of a tiny house that could be deemed a mansion, but the Mansion Elite tiny house design breaks all of our perceptions of what it means to go tiny. Tiny house living doesn't always mean cramped spaces and cluttered environments. 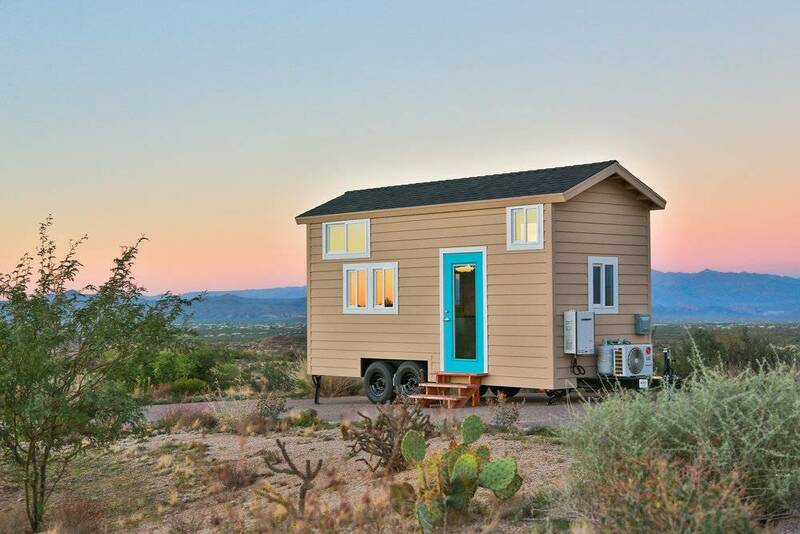 Especially not in this tiny house on wheels from Uncharted Tiny Homes. The Mansion Elite is spacious, clean and bright with loads of practical storage solutions and an efficient layout. The exterior of the home is very minimal as well, and even though there aren't an abundance of windows, on the interior it somehow works. Usually, in tiny house design, the idea is to put more windows in so that it brightens up the space and can also make it feel more expansive. With this tiny house design, the windows are strategically placed, with a mixture of large and small windows which brings light into all areas of the home. Since there aren't a lot of windows, this means there is also more wall space to hang art or the TV. In the unit, you'll see the living room right at the heart of the home with the TV mounted above the staircase that accesses the bedroom loft and a large sofa directly across from it. The kitchen is at one end of the house with the bathroom at the other, and there's even enough room in the bathroom for a full sized washing machine and a dryer. Plus, a full sized bathtub to enjoy long soaks in the tub. This design will stretch your mind too see what can be possible in a tiny house floor plan with just a little bit of innovation and smart planning. Tiny houses don't have to feel tiny, and The Mansion Tiny House from Uncharted Tiny Homes is excellent proof of this. This home shows that with the right design and planning, you can have a smaller space that feels open and airy. It's also interesting that the company doesn't use a lot of windows in their tiny houses, yet on the inside, they still feel so spacious. This tiny house features French doors with glass inserts which also help to create a more expansive feel within the house. They have also placed sufficient windows in the two loft spaces which helps to open and brighten them up. One loft hosts the main sleeping area where a king-sized bed can fit comfortably with still enough room for bedside tables. The other loft has a twin bed in it that is set up with pillows as a daybed, but it's ready for a guest to sleep on as needed. In the kitchen, they've shown a great example of how using darker colours in the small home design can also be a really great idea. The beautiful, rich charcoal grey they used on the cabinets adds a lot of depth to the kitchen which makes it feel a bit larger. So it's not always all about using bright colours, it's about using colours in the right way in the right places. Like many of the Uncharted Tiny Homes, this one has a large fridge and a large range with an oven. Perfect for those who love to cook and for families. Expand your ideas of what tiny houses need to be designed like and get some chic decor inspiration too. For those who love the open style and design concepts of The Mansion tiny home by Uncharted Tiny Homes, but want something a bit more scaled down, the company has a Junior version of their impressive home design. The Mansion Jr. is the smaller version of The Mansion tiny house design, but it still has many of the features of the larger sized home. For starters, it still has the beautiful, minimalist exterior and the entrance off of the side of the home. Then, inside the home, it has the kitchen on one end with the bathroom on the other and the living room at the centre of the home. Instead of having two full sleeping lofts the Junior version only has one full sized loft and a small loft or storage space over the bathroom. The bedroom loft is still the usual size of the loft in the regular sized Mansion tiny house design though with two windows. In the kitchen, you'll notice that there's relatively still the same amount of cabinet and countertop space, but the appliances are smaller. They opted for a mini fridge in this model, and there is no oven or stove in this one. There is, however, a nice flip up desk or eating space at the edge of the kitchen which is an excellent option instead of a fixed table. 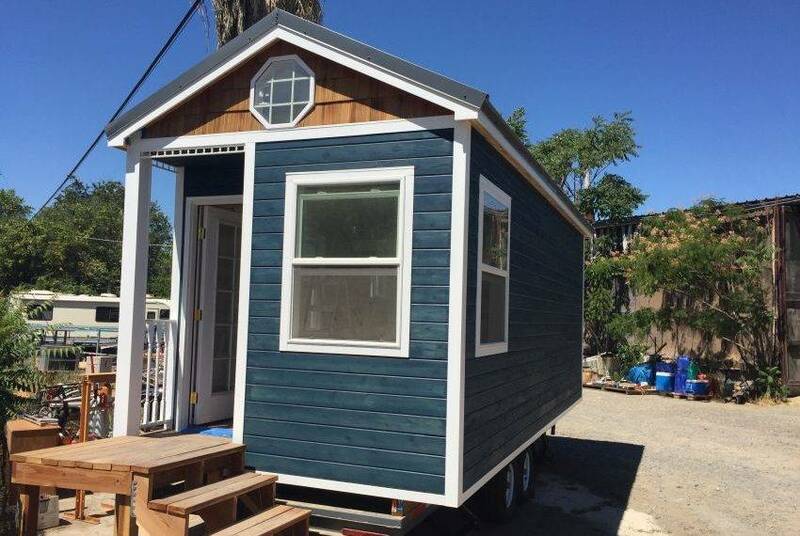 The perks of this compact tiny house design would be the lower price point, plus it would also be much easier to tow and move around. Even though this is only a rendering, it still gives us some great insight into how the layout will function once it's built into a home. These 3-D models help us to visualize the space without having to imagine what the 2-D drawings look like in real life. 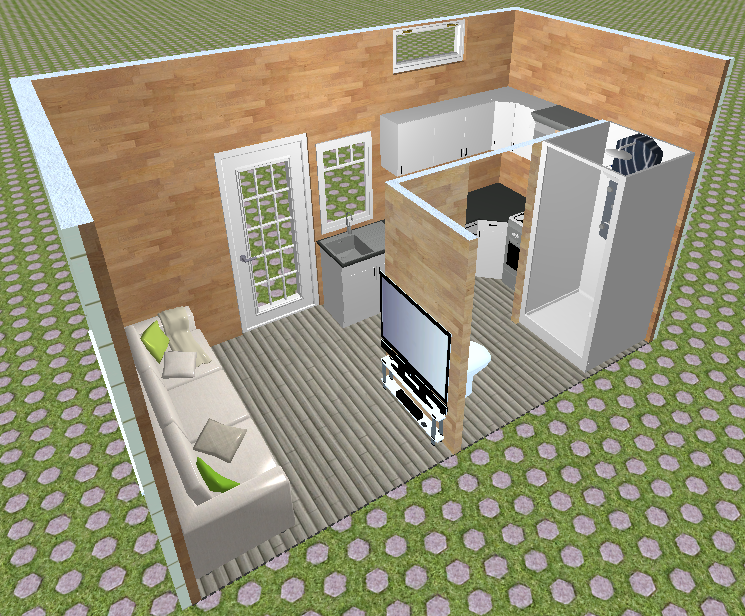 This tiny house design called The Flat is an efficient design that has everything that's needed in a studio apartment. In the UK and other areas of the world apartments or studio, suites are referred to as flats, which is where the name for this one came from. The thing that's so nice about The Flat is that there is a separate bedroom on the main floor with no loft space. That means no stairs or ladders to get into bed, or more importantly, no stairs or ladders to have to climb up and down to get from the bed to the bathroom in the night. The kitchen and living room are grouped together which is quite common in tiny house designs. The L shaped kitchen features a full sized fridge and a full sized oven and range. Right beside the kitchen is the living room with a large sofa and a TV placed on a TV stand with lots of storage which will be essential in a tiny house design. You can also see that the bathroom features a shower, but that could also be a bathtub possibly too, for those who love taking hot baths. There's also a compact version of the floor plan as well so you can see what a scaled down floor plan looks like too. The Limited is a charming tiny house design rendering that shows what this floor plan could look like if it were built into a real home. 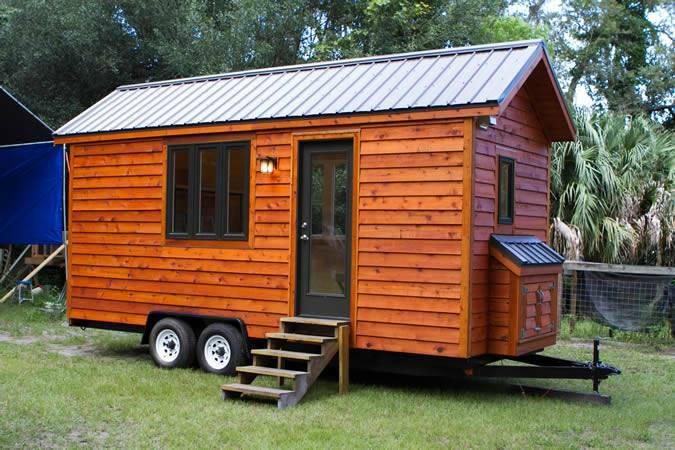 The name suits the limited size of the tiny house but definitely not it's capabilities. Even in a small space like this one, there are so many significant advantages. Keeping the space minimal means it will be more affordable and less space to clean as well, which most of us can be on board with. The floor plan manages to pack a lot into the 175 square feet including a sofa, TV, a kitchen and a bathroom into it which would be great for a studio suite. Simply put a Murphey bed or a convertible sofa in the living room area, and it can be a very flexible space. A space like this could work great as a rental unit or a guest house, or even as a vacation cabin, but there are many different ways a space like this could be utilized. The bathroom is a nice size for how small the home is, and it even has a shower in it instead of just a toilet and a sink. The kitchen impressively has a full-sized or apartment sized oven and range in it as well as space for a small fridge. Adding a loft to this tiny house would be a great way to add some more space without having to expand the floor plan at all. That would add just that little bit of extra space for sleeping or storage. This tiny house design called the Basic Bungalow would make for the perfect backyard building. Accessory units like this are usually allowed on most properties that already have a primary home on them, or they are okay to be used as a recreational home. The tiny house design stands by its name in being quite a basic home design. There is a living room and kitchen area sharing the main space in the unit, and then a simple bathroom with a toilet and room for a sink or a shower. A unit like this with only a toilet in it could be great for a guest suite to have on your property when people come to visit. Or as a space to rent out to travellers. Having a shower in it would definitely upgrade the design and make it more comfortable for whoever is staying in it. Then the kitchen sink could be used as the bathroom sink as well. This rendering shows how the furniture could be set up in the space and there is plenty of room for a large sofa, maybe even a pullout sofa or a sectional. There could also be room for a desk or a small dining table in beside the kitchen or even bar seating to take up less space. Of course, there is no separate bedroom so the living room would have to double as a bedroom much the same as would happen in a studio apartment. This tiny house design could most likely be adapted to either a tiny house on a trailer or a tiny house built on a foundation depending on the client's needs. Here's a charming tiny house on wheels that was inspired by the Arts and Crafts style of architecture that was popular in the early 1900s. You can see the details that make it so characteristic of this style including the cedar shakes and the white trim as well as the rounded window. Inside, all of the cabinetry is handcrafted including the gorgeous storage staircase leading up to the loft. Since you need as much storage space as you can get in a tiny house why not add some in under the stairs? The kitchen consists of a small countertop with a built-in gas range and a sink, there is also bar seating extending from the kitchen counter to provide seating for two to dine while gazing out the window. The home's kitchen also has an apartment sized fridge providing lots of space to store fresh fruit and vegetables, meat and dairy. Past the kitchen is the cute little bathroom with a nice sized shower, a mini sink and vanity as well as a flush toilet. The loft is located above the bathroom and provides enough space for a double or queen sized mattress with enough room to move around and have storage. Since the entrance door is on the long side of the tiny house, this gives the owner the perfect opportunity to build a deck onto the side of the home. Or even a simple set of stairs with a landing as shown in the photos of this home. You don't need to go big for your home to have a lot of character, you just have to choose a style that suits you best and implement it into your design. A home that's fit for life on the beach the Beach Bungalow contains everything needed to enjoy a life filled with relaxation. Whether it would be a full-time or part-time home, the home has all of the amenities of a conventional home in it's smaller footprint. The exterior exudes the style and charm of a cute beach house with the cedar shakes on the upper portion of the home and the deep blue wooden tongue and groove siding on the bottom. Inside, the designers and clients chose a very fresh and neutral colour palette with the odd pop of blue here and there. Mainly white, cream, tan and brown fill the home which is exactly what helps keep the energy calm and cool in the home. The home features a great bench sofa in the corner of the living room surrounded by windows to allow the light and fresh breezes in. Further along, there is the kitchen which has an L-shaped countertop with a farmhouse style sink and a gas range built into the counter. The sliding barn door leads into the well-appointed bathroom with a mini sink and a flushable toilet as well as a shower stall. Up above the main floor is the loft area which is accessed by the fantastic staircase complete with storage built right in. There is only one loft in this tiny house, but there is also more storage thanks to the built-in shelving unit on one of the walls. It's easy to imagine relaxing in this home with the distant sound of crashing waves in the background. 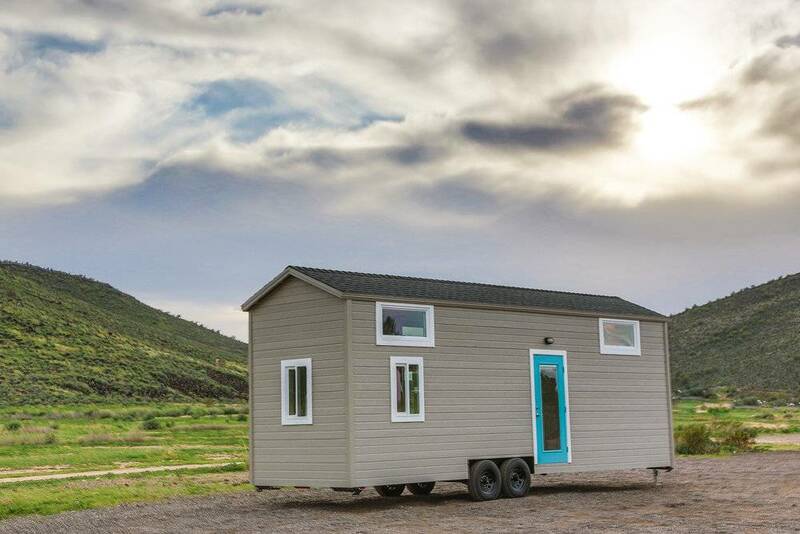 A tiny house with a main floor bedroom and 309 square feet may seem impossible, but the Roomy Retreat 28 foot extended edition proves that it's far from impossible. The seafoam green wooden tongue and groove siding with the cedar shakes and white trim welcomes you into the tiny house which holds so much to be admired. The main floor bedroom is one of those admirable features since many tiny houses opt to have the bedroom in the loft. For this main floor bedroom, they took the height of the ceiling for the loft above and kept it shorter than average so the bed could fit underneath. Then above, is a beautiful little seating area or it could be used as an office space too. There's also a second bedroom area on the other side of the home which is a lofted bedroom this time, and it's above the kitchen and bathroom. The staircases leading up to both of the loft spaces are joined in the centre, and both contain storage which is always essential in a tiny home. The kitchen features a built-in range and a large farmhouse style sink with a large fridge and microwave. The bathroom contains a composting toilet which is popular for off-grid tiny houses, and a large sink and vanity to store items in. The builders at Sierra Tiny Houses also added in a shower and an all in one washer and dryer unit which would be sure to come in handy. The interesting feature wall in the living room area is also pretty cool made up of different shades and types of wood. 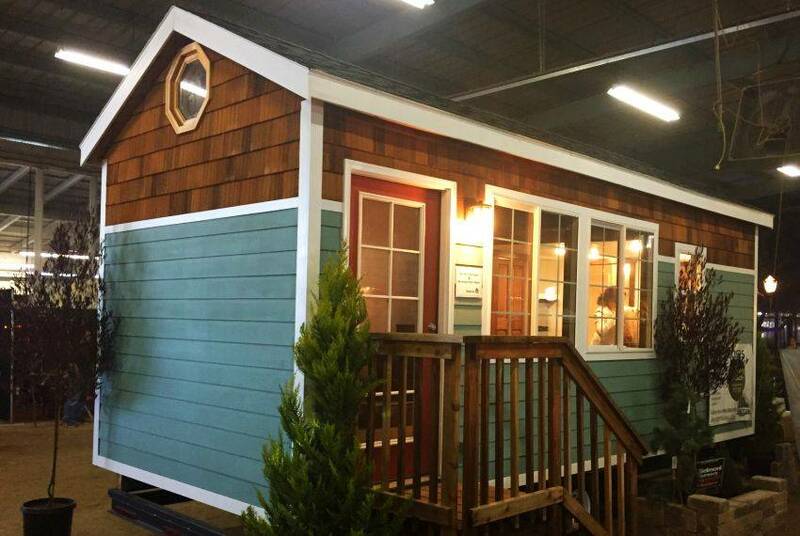 The Roomy Retreat, 24-foot edition, is another option for this model from Sierra Tiny Houses. With a ground floor bedroom and a loft sleeping area, there are choices for those living in this tiny house on wheels. Like the Roomy Retreat 28 foot addition, the 24-foot addition has the living room in a loft area. Unlike most loft spaces, this loft has lots of headspace thanks to the ceiling of the bedroom area below being shorter. 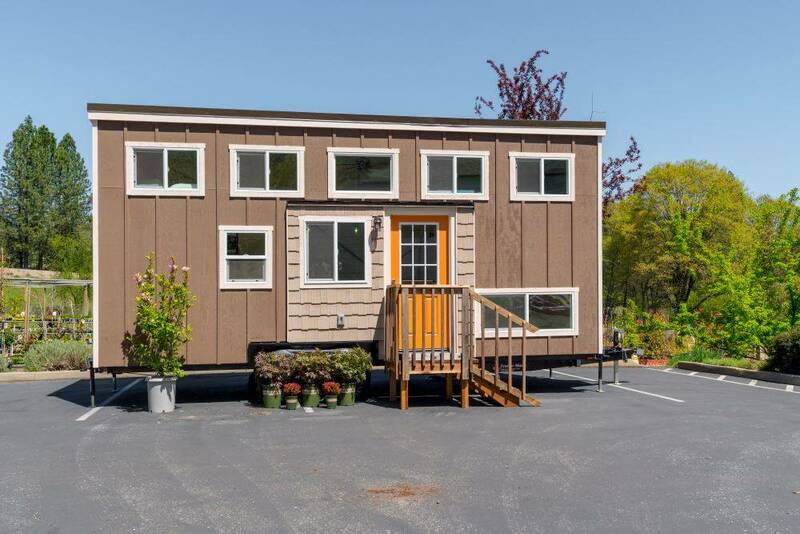 The entire home is 273 square feet which is actually a lot of space for a 24-foot tiny house on wheels. The smaller models will be easier to tow and move around, so they're perfect for short-term stays. The storage staircase provides some extra storage within the home as well which is always essential for small house living. There are two sides to the stairs leading up to each of the loft areas. So no ladders are required at all in this tiny house design. The bathroom features a mini sink and vanity that's perfect for the small space, as well as a shower and a flush toilet. In the kitchen, you'll find a sizeable farmhouse-style sink, a double gas range and an extension to be used as an eating area. There's also a microwave and an apartment sized fridge in the kitchen for convenient cooking and food storage. The Roomy Retreat, 24-foot edition, shows just how comfortable and practical the smaller version of this model can be and how spacious it still is even after letting go of 4 feet in length. Here's a tiny house that's just in the beginning stages of being planned out and built. As you can see, they have the flatbed trailer all ready to go with the floor system in place. 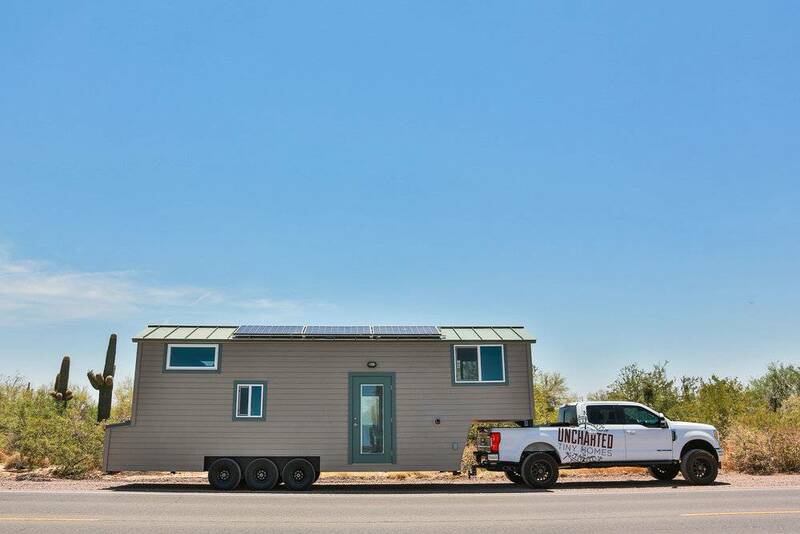 The trailer here will act as the foundation for the tiny house, and the double axel system will help to carry the weight of the home on wheels. 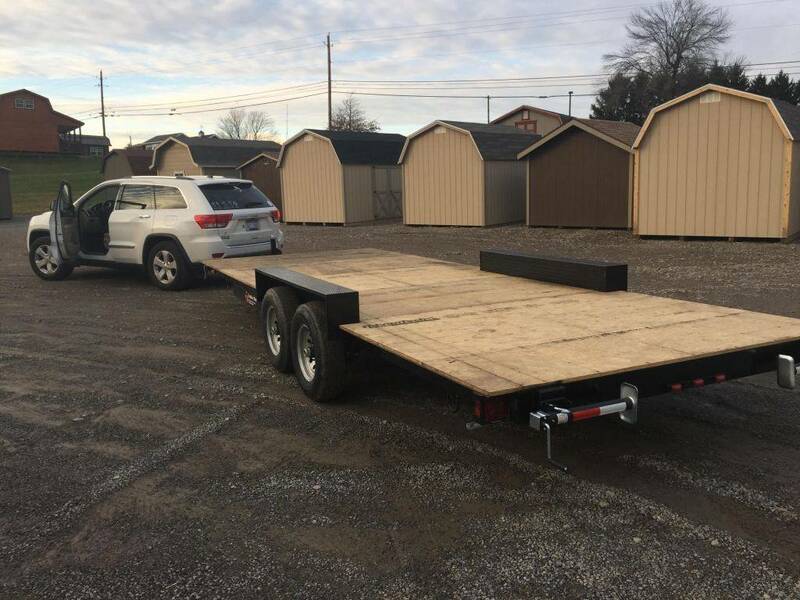 You can then look at some of the floor plan ideas for tiny houses including the one that will likely be built on this trailer. This larger floor plan will include two lofts that can be used for sleeping or storage, a living room, a kitchen and a bathroom. The lofts will also be accessed by staircases which will make it much easier to climb up and down. There will also be space for dog beds as well in case the owner has pets. You can see in the L shaped kitchen that there will be a built-in range as well as a sink and lots of counter space. A full sized fridge will also fit in the kitchen, and the oven will most likely be a small convection oven or a microwave. In the bathroom, they'll have a toilet, sink and a shower stall. Then in the living room, a smaller sofa can fit nicely on the back wall. Outdoor storage is also added on which will hold the propane tanks and any of the additional mechanical equipment needed for the home. Next, the trailer will have its walls built, and roof system put in place. The Yearling park model cabin has 399 square feet of space in a modern design that has a shed roof and double french or sliding glass doors. 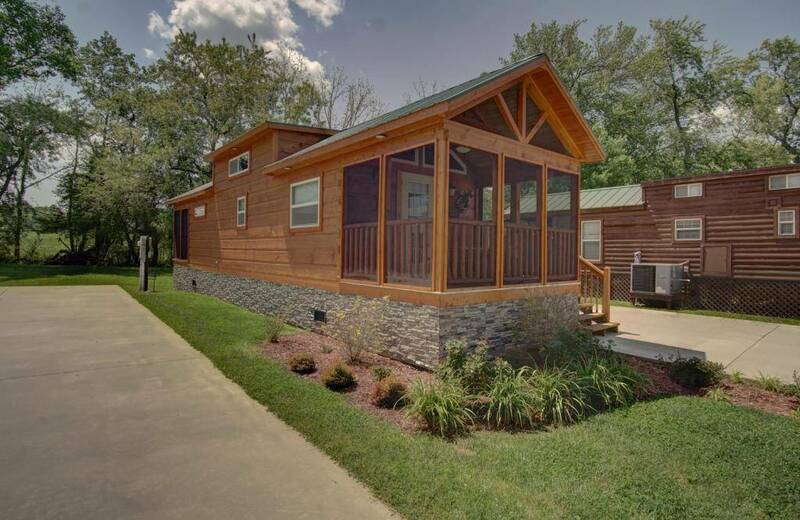 This park model cabin has a fully enclosed bedroom and a spacious bathroom with a vaulted ceiling. The Yearling has a full-sized end wall kitchen with a Whirlpool fridge and range, laminate countertops, and a deep cabinet over the fridge. The Yearling has solid log construction with luxury vinyl plank flooring. The bathroom has a 54-inch tub shower. You'll love the bedroom with its built-in queen sized base with drawers, and barn door entrance. The Yearling has a large storage closet and linen shelves for your storage needs. There are plenty of upgrade options available to suit your budget, lifestyle and needs. This park model cabin is perfect for use at campgrounds, RV parks or as a personal vacation retreat. 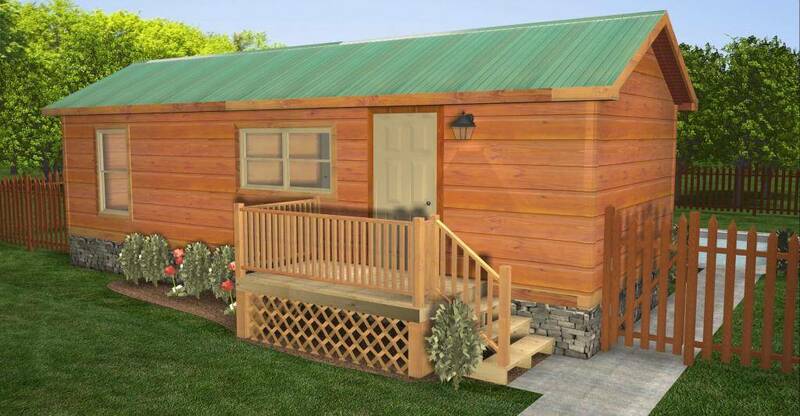 The Yearling is a park model cabin available from Green Living Log Cabins. The Yearling is a good size for a couple or a small family (with a sofa bed in the living room). Green Living is located in Campobello, South Carolina. 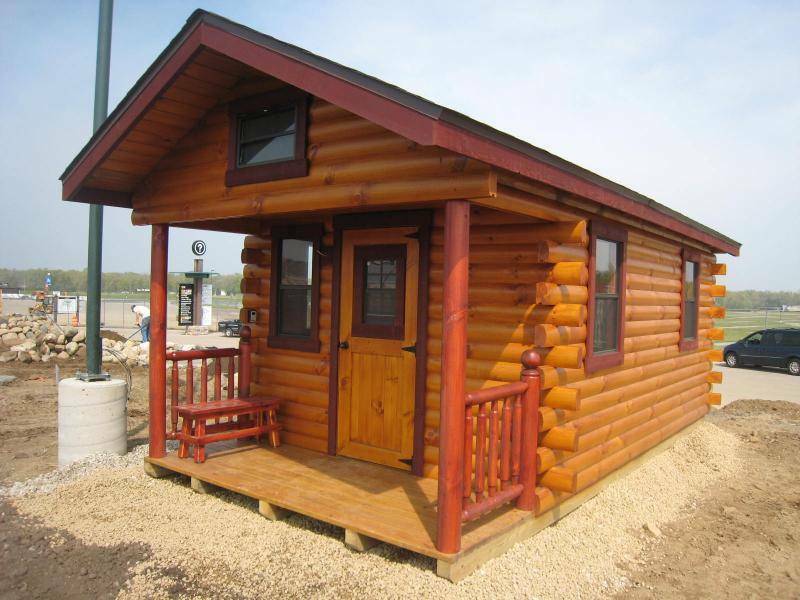 This log cabin company has a variety of park model cabins and modular cabin designs available. 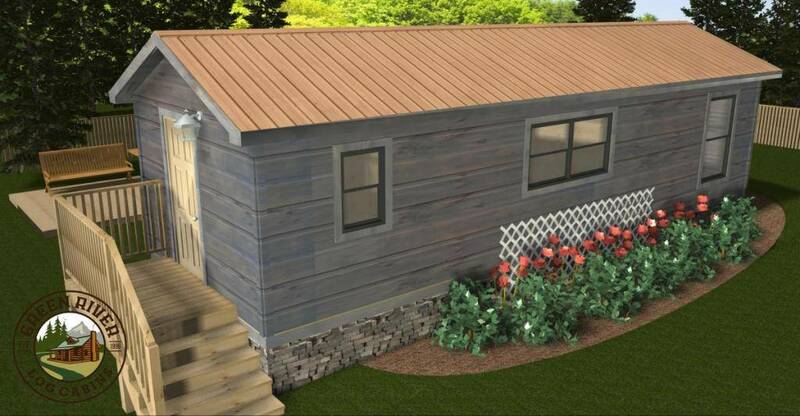 The Low Country Cottage is a new floor plan that has the look of natural bark siding. There is also a copper-colored roof and bronze windows for a unique look you will love. The Low Country Cottage has a triangle gable that is a nice feature. The Low Country Cottage is a solid log construction with luxury vinyl floors, and granite, quartz or solid surface counters. The wood cabin has a full sized kitchen with custom built stained cabinetry, an upper cabinet over the fridge, spice cabinet, stainless steel kitchen sink, full-size black fridge, range and dishwasher. Other features in the kitchen include an extended shed dormer with window over kitchen and LED recessed lights. The bathroom has a 48-inch tub, and medicine cabinet. The Low Country has a laundry closet with washer and dryer. This wood cabin is beautifully finished with wood throughout. There is an LP fireplace with mantle rock surround. The master bedroom has a built-in king-sized base with drawers, a split wardrobe with USB ports, and dual over bed lighting. The Low Country has a 10 foot screened porch with black railing. The Low Country also has a spacious loft with bookcase ladder access. 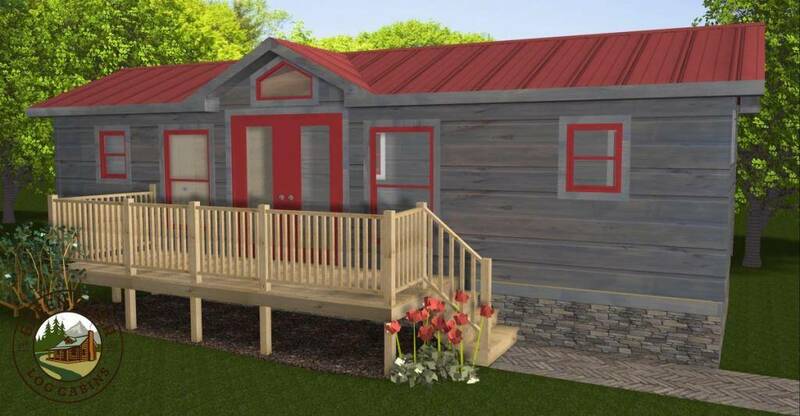 The Low Country is just one of the park models available from Green Living Log Cabins. The Riverview Bunk House is a wood cabin that is great for large or multi-family vacation getaways. This wood cabin can be used in RV Parks, campgrounds or as a vacation retreat in the mountains. The Riverview has built-in storage drawers under the bunk beds, and the queen sized bed. This wood cabin design also has a good sized loft accessed by stairs or a floating staircase. The Riverview has a large porch and lots of windows to let in natural light. The Riverview has solid log cabin construction, luxury vinyl floors, laminate counters (upgrades available), and stained kitchen cabinetry and rafters. The kitchen has a cabinet over the fridge, a spice cabinet, stainless steel single bowl kitchen sink, full-size black fridge, range and dishwasher (upgrades available). There is a shed dormer with a window over the kitchen and recessed LED lights. The bathroom has a bathtub with shower, and medicine cabinet. In the master bedroom, there is a queen sized base with drawers and dual over bed lighting. The Riverview has a spacious loft with bookcase ladder access. The Riverview RV Bunk House is a wood cabin available from Green Living Log Cabins. Green Living Log Cabins is located in Campobello, South Carolina and have a variety of park model RVs and modular cabins available. The Campside RV Park Model is just the right size for a family or multiple guests. The Campside RV Bunk model is fully upgraded with a central living area, a master bedroom and bunk area, and a full sized kitchen with a full-size appliance package. The Campside is beautifully designed with wood used throughout for a wood cabin you will be sure to love. The layout of the Campside RV Bunk model is great for RV Parks, campgrounds and as a personal vacation retreat. The Campside has solid log home construction, hickory hardwood floors, laminate counters with granite or solid surface upgrades available. The kitchen has a deep cabinet above the fridge and black Whirlpool appliances. The separate master bedroom has a built-in queen bed base with drawers, dual over bed reading light, and split wardrobes. It's easy to imagine the Campside RV park model beside the lake, as a vacation home to spend time with family and friends, and a place where you can make lasting memories. The Campside RV Bunk Model is available from Green Living Log Cabins located in Campobello, South Carolina. Green Living Log Cabins have a variety of park model RVs and modular cabins available. The Swedish Steam is a beautiful basic wood cabin. 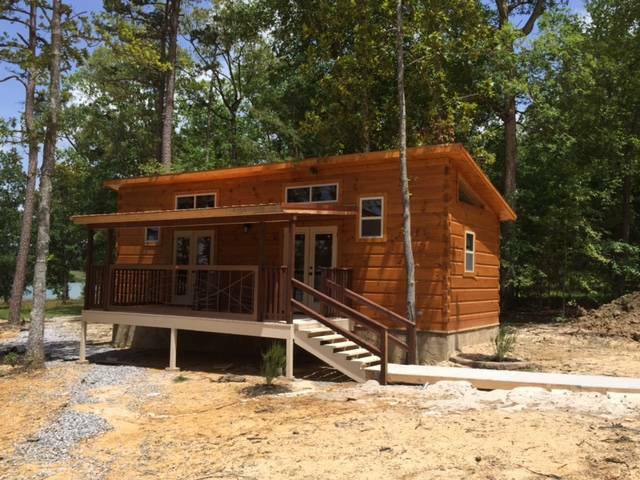 You will find several upgrades available with this wood cabin to suit your lifestyle and needs. Some of the upgrades include dormers, a fireplace, built in wardrobes, granite counters, hardwood flooring, and more. The layout of the Swedish Steam wood cabin is great for lake or river lots and vacation retreats. The Swedish Steam has 399 square feet of space with one bedroom, one bathroom, a kitchen and large living area. The Swedish Steam has solid log construction with luxury vinyl plank flooring. This wood cabin has a breakfast bar with overhang, laminate counters with solid wood kitchen cabinetry and an upgraded finish. There is a deep kitchen cabinet above the Whirlpool fridge, a range, dishwasher and vented hood. There is also a large kitchen pantry. The Swedish Steam bedroom has a queen bed base with drawers with dual reading lights overtop the bed. The bedroom also has two split wardrobes. This wood cabin has a laundry closet with washer and dryer. The Swedish Steam is just one of the wood cabins available from Green Living Log Cabins. Green Living Log Cabins is located in Campobello, South Carolina and have a variety of park model RVs, and modular wood cabins available. The Greyson Best is the fully upgraded model from the Greyson Series of wood cabins. This upgraded wood cabin design has 399 square feet of space. The Greyson Best has a front living layout with a large loft, a good sized screened porch, and a full sized bedroom. The Greyson Best has custom built-in storage, with a full sized appliance package, and granite counters throughout. The Greyson Best has natural wood throughout the cabin for a look you will love. The Greyson Best is excellent for RV Parks, campground or as a vacation retreat. Some of the features included in the Greyson Best are the solid log construction, hickory hardwood floors, a built-in queen sized base with drawers, and split wardrobes. Other features include the laundry closet with washer and dryer, solid wood interior pocket doors, a full rock LP Fireplace, a loft with log stairs and storage drawers. Several other features are included with this wood cabin floorplan; you will want to look at the site for the full list. The Greyson Series is available from Green Living Log Cabins located in Campobello, South Carolina. Green Living has a variety of park model RV wood cabins and modular cabins available. The Greyson Series Better has many of Green Living Log Cabins best-selling features. The Greyson Series Better has 408 square feet of space, with a spacious feel throughout the wood cabin. 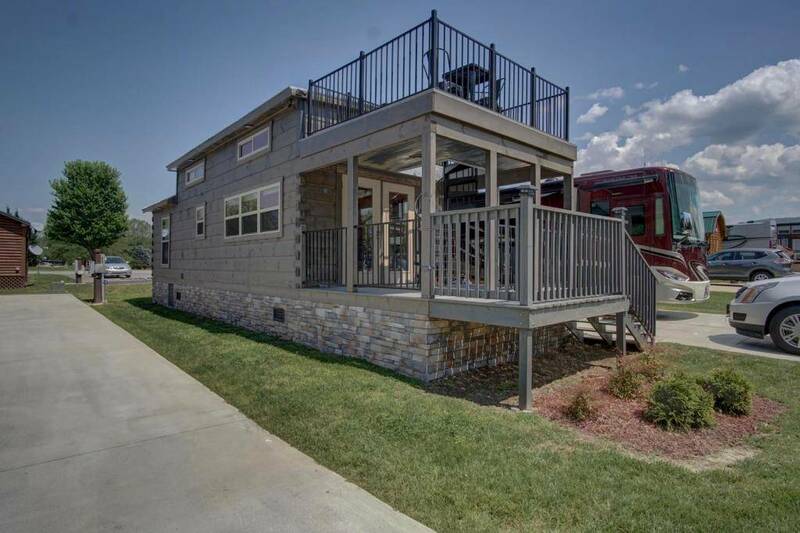 The Greyson Better has an added loft with stair access, along with a breakfast bar, porch and more. The Greyson Better layout is great for campgrounds, RV Parks, or for use as your vacation retreat. The Greyson Better has a full-sized kitchen, full sized bathroom with a bathtub, room for a washer and dryer, one bedroom and a good sized living room. The loft can be used as an additional bedroom for the kids or when guests come to stay. It's easy to imagine the Greyson Better at your favorite campground, at the lake or close to the mountains. You'll love the natural wood that is used throughout the Greyson log cabin plan. The Greyson Series (Better) is available from Green Living Log Cabins. Green Living Log Cabins is located in Campobello, South Carolina. The Greyson Better is just one of the wood cabins you will find from Green Living Log Cabins, they have plenty of other park model RVs and modular log cabin designs to suit most any budget, lifestyle and need. The Greyson Series (Good) is a log cabin Park Model RV available from Green River Log Cabins. This wood cabin is fully modularized. 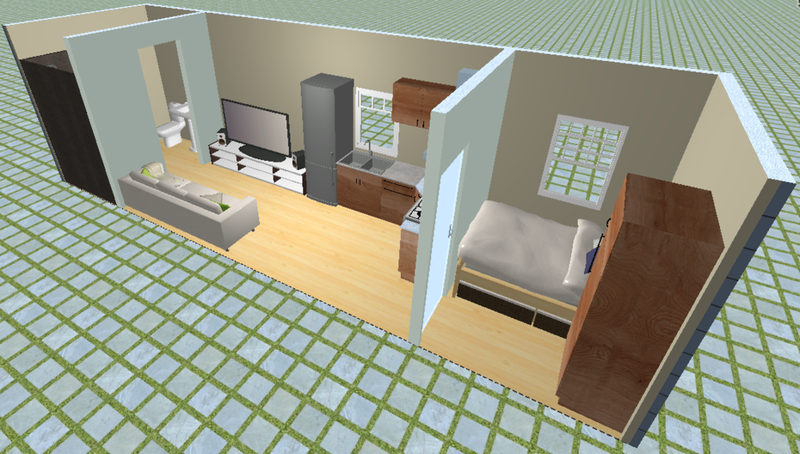 The Greyson Series (Good) has 399 square feet of space with one bedroom and one bathroom. This lovely wood cabin uses wood throughout with wood walls, ceiling, kitchen cabinets and built-in storage. There is a full-size kitchen and full-size bathroom with bathtub. There is also space for a washer and dryer. The Greyson Series (Good) has everything you need for a comfortable stay. The Greyson Series (Good) is a nice sized model suitable for a couple or a small family (with a sofa bed in the living area). Imagine yourself at the lake or mountainside in this quality wood cabin design. The Greyson Series is from Green River Log Cabins located in Campobello, South Carolina. The layout for the Greyson Series is great for campgrounds, RV Parks, or for your own vacation retreat at the lake or close to the mountains. You can also choose components and options to add to the basic floor plan to suit your lifestyle, budget and needs. You might choose to add a loft, porches, upgraded kitchen counters, laundry, and more options. The Top-line Series (Best) is a log cabin park model RV with 399 square feet of space. The Top Line Series is beautifully designed with wood throughout for a log cabin design you will love. The Top-line Series (Best) has one bedroom and one full-sized bathroom, suitable for a couple or small family. The master bedroom in the log cabin design has a custom built-in bed suitable for a queen-sized bed, along with built-in cabinets above the bed for additional storage. The Top-line Series (Best) has a full sized kitchen with stainless steel appliances and a bar countertop, great when guests come over to visit. The Top-line Series (Best) has a generous upstairs loft that can be used as a bedroom for the kids or when guests come over to visit. This log cabin has a front living layout and double dormers. There is also a good sized screened porch and lots of custom built-in storage. This layout is great for RV Parks, campgrounds or your very own vacation retreat. 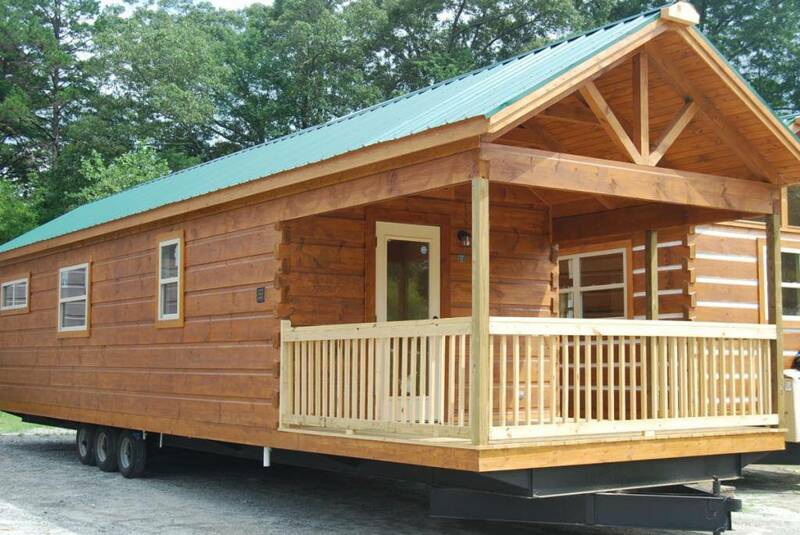 The Top-line Series (Best) is a log cabin that is available from Green River Log Cabins in Campobello, South Carolina. 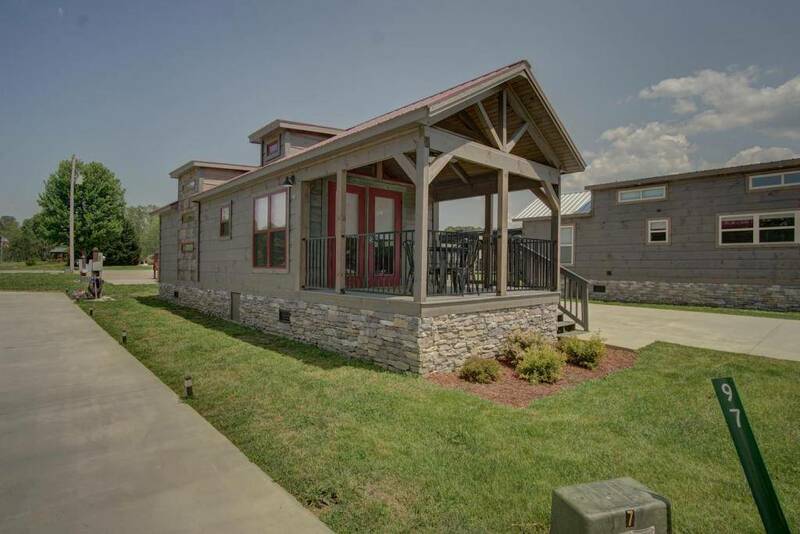 Green River log cabins have log cabin park model RVs and modular log cabins available.